The education projects we support have a lasting and deep impact in the lives of the children who benefit from it. 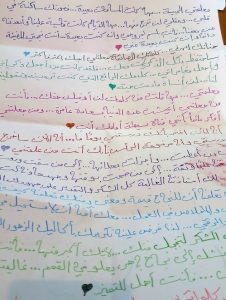 This beautiful letter from Dima to her teachers is the best proof of it. My four children and I have been in Lebanon for six years now. Before enrolling Dima in the MERATH partner education center, she used to beg me to bring her a home tutor, but I could not pay for one. We used to fight about this! Now that she has been in the center for a year, she has many dreams. She wants to travel abroad and study. She seems to better cope with our difficult situation in Lebanon. I am very thankful for the people who support this center and I want to encourage them to support even more because there are still many children who do not have access to any kind of education. This is the first school that I love that much. If we do something wrong, the teachers don’t just shout at us : they sit and talk with us and take time to clarify what is wrong and how to fix it. I wrote this letter for the teachers to thank them, because I deeply love them and I was sad the school was closing for the summer. “My dear teacher, no matter how far the distance is, your image is carved in my heart…and my mind. It will never go. No matter how tough the days are and how far we are from each other, you are the medicine to my scars, you are always my shining star. Your compassion blew me away […] I will keep all the memories I made with you. They were some of my most beautiful memories and amazing adventures… The sweet and honest words that you always used to talk to us, I will remember them as long as I am alive! My teacher… no matter what I tell you, the words cannot do you justice. You are the one who helped me live my life with unraveling joy […] I feel proud now. I am getting out of school and I am holding my head up high because you are the one who taught me. To the one who gave it all and so much more, to the one who provided us with knowledge and confidence… to the one who sacrificed her time and efforts and reaped the fruits of her labor, to you my darling teacher, all the thanks and appreciation for your precious hard work. We have learned, from you, that success is valuable and meaningful. From you, we learned how to work with dedication and loyalty. Thanks to you, we believe that nothing is impossible […] You are the one who turned failure into flying success, as high as the mountains. Our dearest, we thank you for your efforts and appreciate your work. You deserve nothing more than to be distinguished. > Check out our annual report!